Posted September 21st, 2017 by Jeremy Dalton. Entertainment finds a new dimension with the right kind of audio and visual experience. To take your entertainment to a new level of enjoyment, you need to have a home theatre at your place. From movie viewing to gaming, home theatre can offer you an amazing experience during your leisure. If you are based in areas like Atlanta, Fayetteville, Griffin GA, Marietta, McDonough or Peachtree City and looking for a right company from whom you can get the high-quality home theatre system, then come to us at Atlanta Entertainment Systems. We are one of the best companies in these areas in terms of providing you with the one of the most updated and latest home theatre systems. Are you wondering how you will be able to buy the right system for your home entertainment? If yes, then you must take a look at the following points to know more. Consider the Size of Room: When you are thinking of installing a home theatre system at your home, you need to select a room where you will be setting it up. And you must consider the size of the room too. Depending on it, you can decide the size and the resolution of the home theatre. Purpose of Home Theatre: Are you going to use it mostly for watching films? Or are you looking forward to a super gaming experience as well? Basically, you need to figure out why you are investing in a home theatre system. Depending on the purpose, you will be able to decide the features you want. And only then you will be able to find the perfect home theatre for you. Audio and Visual Impact: It is necessary that the home theatre you are buying, provides you with the best audio and visual experience. For example, we, at Atlanta Entertainment System, use THX and CEDIA is designed our home theatres. Be rest assured, you are investing in the right system if you buy from us. So, now as you know about these tips what are you waiting for? Call us now at 770-744-5373 to get your home theatre. 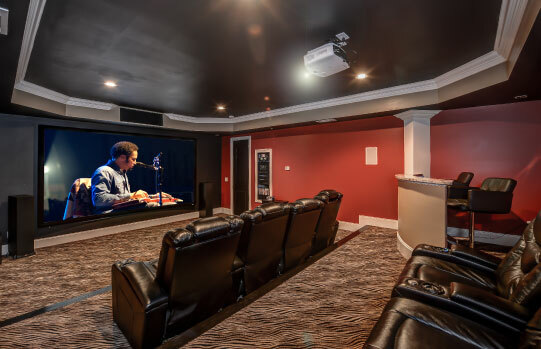 Home Theater in Marietta, McDonough, Peachtree City, nearby cities. Home Theater Installation, Home Automation, and Home Audio Systems available in our service areas.